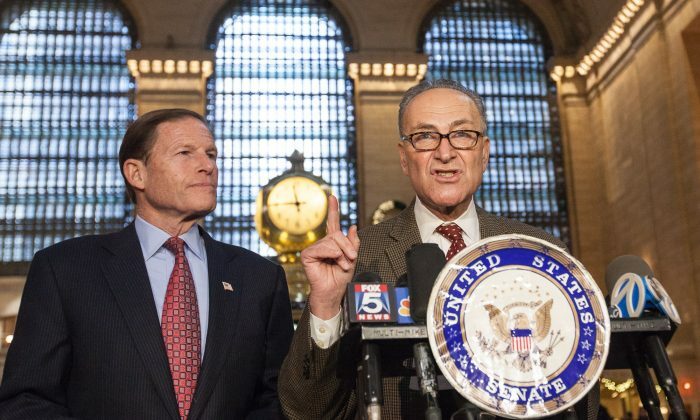 NEW YORK—An inquiry by two senators from New York uncovered that the Federal Railroad Administration (FRA) is only funded to inspect 1 percent of the tracks nationwide every year. In the wake of the Dec. 1 deadly train derailment near the Spuyten Duyvil station, the FRA announced on Dec. 12 a two-month safety review of the Metro-North Railroad. During this week’s congressional briefing, FRA officials said they would like to send similar teams of experts across the country, but don’t have the money to do so. At a Dec. 15 press conference the Grand Central Terminal, Sens. Chuck Schumer (D-N.Y.) and Richard Blumenthal (D-Conn.) announced they will push for the FRA to get the money. “It’s foolish and dangerous to starve the nation’s chief rail safety agency,” said Schumer. The state of the tracks was ruled out as the cause of the accident that left 4 people dead and 60 injured. But the FRA is also responsible for overseeing the Metropolitan Transportation Authority (MTA), an operator of the Metro-North Railroad. “We’ve sort of surmised … that the MTA was not doing enough,” Schumer said, pointing out the FRA didn’t have the resources to prod MTA to increase safety measures. Due to sequestration, federal spending was cut by over $85 billion this year and the FRA thus lost $9 million, according to the senators’ press release. Schumer and Blumenthal urged the Congress to grant Obama’s request of $185 million for safety and operations that would raise the FRA 2014 budget about $15 million. That would allow for another 45 inspectors. Since the accident, Metro-North has adopted a host of new safety measures, including an alert system that would trigger the brakes if a train doesn’t slow down to 30 mph before the Spuyten Duyvil curve, according to MTA website. Metro-North engineers are also developing a system to automatically slow trains down at four other “critical curves” by March, and at five movable bridges by September.